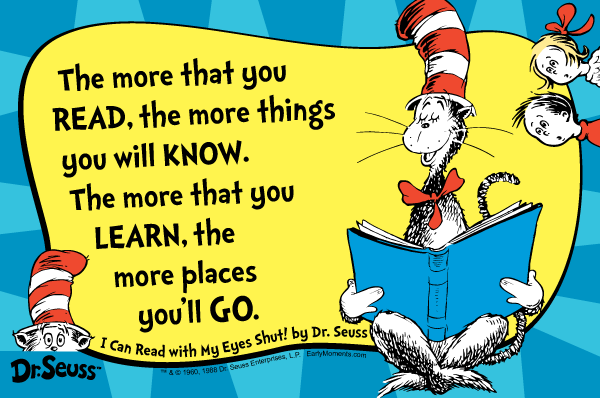 Dr. Seuss really knew what he was talking about with this quote! 2/3 of students who cannot read proficiently by the end of fourth grade will end up in jail or on welfare. One in four children in America grows up without learning how to read. Students who don’t read proficiently by the third grade are four times likelier to drop out of school. Nearly 85% of the juveniles who face trial in the juvenile court system are functionally illiterate, proving that there is a close relationship between illiteracy and crime. How will you, in this new year, make a greater commitment to reading and continuous learning, to support yourself and those you care about going to more wonderful places? This entry was posted in Learning, Literacy, Readings and tagged Barry Demp, Demp Coaching, Learning, literacy, Reading, The Quotable Coach by Barry. Bookmark the permalink.